...can solve a multitude of problems. And even if that's not true, beautiful flowers sure can't hurt anything! I simply stamped Avery Elle's Floral Frame onto some Canson Montval watercolor paper using my handy-dandy Mini Misti and heat embossed using Ranger White Satin pearl embossing powder. I colored the gorgeous flowers using an array of purple and teal-y green Zig Clean Color markers, blending and adding shadows with a wet paintbrush. 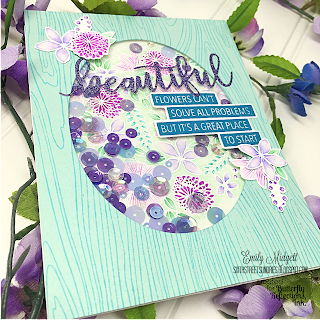 The greeting is from Concord and 9th's Beautiful Words stamp set and Wonderful Words dies, stamped with Altenew's Shades of Purple mini ink pads. 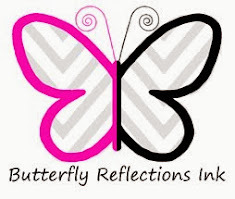 The die cut sentiment was die cut twice from regular card stock and once from shimmery silver card stock, then glued together to add some dimension. The final touch was a smattering of sequins from the Delphinium mix by Lucy Abrams. My next card was certainly inspired by the previous... I am really loving this color combination. I received the incredibly beautiful You're My Person set from Concord ad 9th last week, and I couldn't wait to get it all colored up with my Zig markers. I first heat embossed it with white detail embossing powder on another panel of Montval watercolor paper, then colored it with the same purples and teals in the Zig line. Once that was done, it was time to work on the front panel of my shaker. I stamped the Hero Arts Woodgrain Background stamp on a panel of light aqua card stock using Altenew's Cool Summer Nights mini inks. The sentiment, from Concord and 9th's You're My Person set, was also stamped with the Cool Summer Nights mini inks... they aren't lying when they call them "crisp" dye inks... no bleeding with that super detailed sentiment! I die cut the "beautiful" from the C&9th Beautiful You die set using some purple glitter adhesive paper in my stash. After die cutting an oval from the center of my woodgrain panel, I arranged my sentiment the way I wanted, then realized that the front panel needed to tie into the back panel somehow... so I (being the somewhat crazy person that I am) decided to heat emboss another of the floral stamps from the You're My Person set and color a few blooms, some berries, and some leaves then fussy cut them out... despite their teeny tiny-ness. (You've heard the saying "the heart wants what the heart wants?" Well, the card wanted what the card wanted. 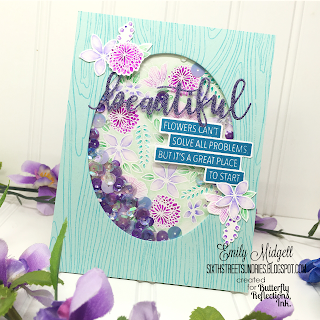 It couldn't be helped, even if my carpal tunnel started acting up afterwards....) After arranging my tiny flowers and sentiment pieces on the front of the card, all that was left was to fill the shaker with more Delphinium sequins. Absolutely beautiful cards, the fussy cutting was definitely worth the end result! I wish Concord & 9th would release dies for Wildflowers & You're My Person!